I was staying in Padstow over the 2000-2001 New year once (the real dawning of the Millennium but that’s another story! ), after escaping some of the worst sounds of the party being held in a pub in the town I went to bed earlier so that I could greet the new dawn. The next day was a delightful one full of clear skies and promise, I got up early the next day to be greeted by the spectacle of local people with blackened faces playing traditional instruments of drums and accordions and singing with much gusto. A strange sight and one which in recent years has become much in contention beyond Cornwall. 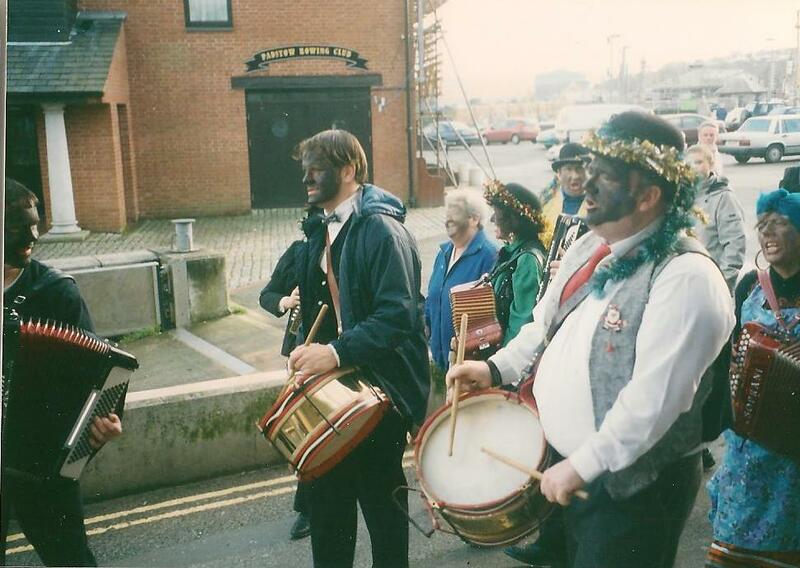 I’d written this post back in 2011 and did not post…perhaps I was a bit nervous of doing so…..and its only posted now as I have been ill and did not have time to do another post…..interestingly its more current than ever, what with news reports about banning black faced Morris in Birmingham so its worth examining a new. A black mark against the town? Padstonians insist that this is not the case and deny both description and allegations and indeed as early back as the 1970s the content and conduct was apparently reviewed to avoid offence…although one must remember Love Thy Neighbour and The Black and White Minstrels were popular at that time!! That said the Devon and Cornwall Constabulary did get involved and saw no reason for arrest. 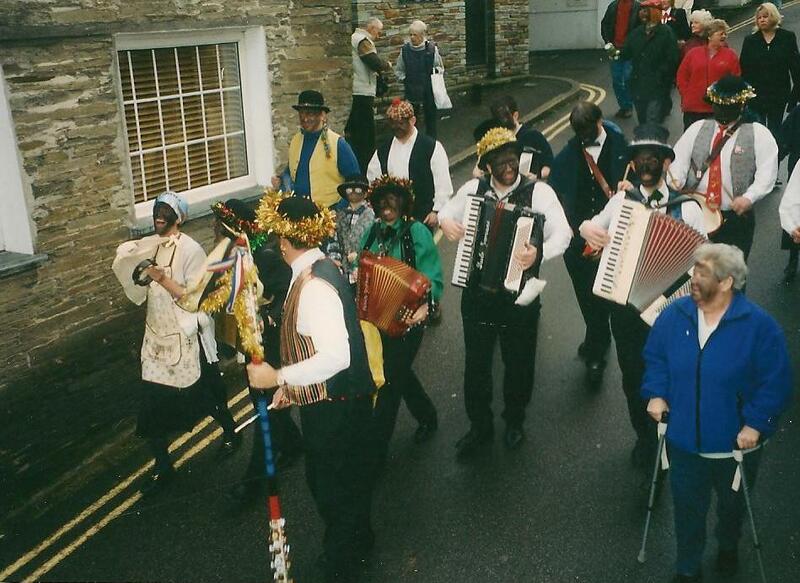 The Padstonians showed obvious concern and renamed it Mummer’s day but the controversy continues. An online article using local informants recollects their involvement in the 1940s and then into the early 20th century when their parents were involved. On this basis it can be included as a surviving custom if it is a rather secretive one, but possibly a changeable one. 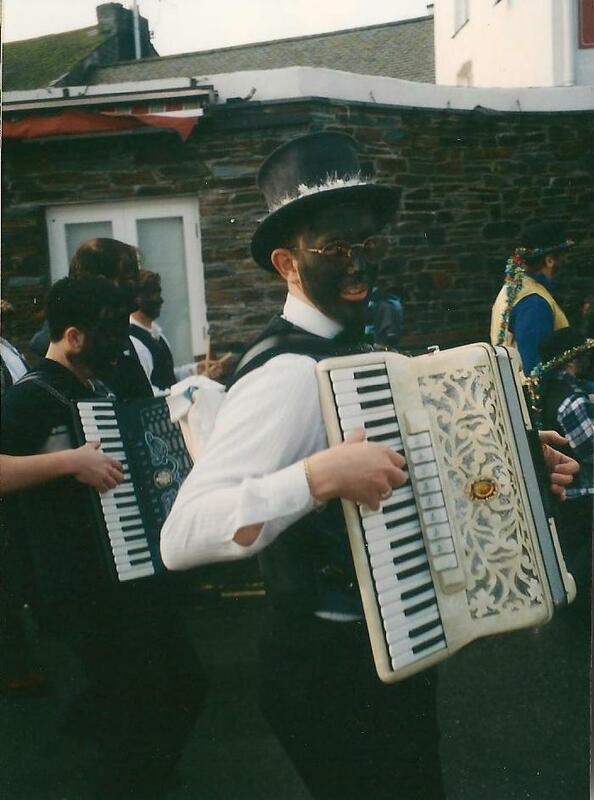 The origins of the day are confusing; the blackening of one’s face after all is very common in a wide range of folk customs from mummers to molly dancers. The overall theme being to disguise the face, so that in most cases the employers would not have recognised them, as the majority of the customs, including this one, were begging. This has probably been done for centuries long before English people ever had contact with our African relatives. 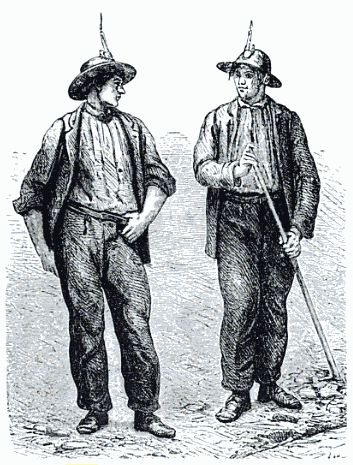 Whether confusion occurs is the claim that it stems from the town’s experience with slaves, emphasized by a tradition that slaves were allowed free time in the town and this would have naturally brought they into contact with the natives. This happened elsewhere and did not create a folk custom, which suggests that the Cornish were either more susceptible to the traditions the slaves had or in support of the non-racist origin had greater sympathy, a point I will explore later. From what can be gathered is that the original tradition was closer to a mummer’s play and perhaps because it was undertaken mainly by children who I argue either had difficulty in remembering lines or else the play had unsuitable themes, someone changed it. Anyone who has children will know it’s easier to get to get them to sing carols than do the nativity! “I believe that the mummers went from house to house performing their play and got fed up with the same old lines and tried out the new at that time Foster music hall songs. This was enjoyed and response probably favourable and the tradition took off in place of the mumming”. 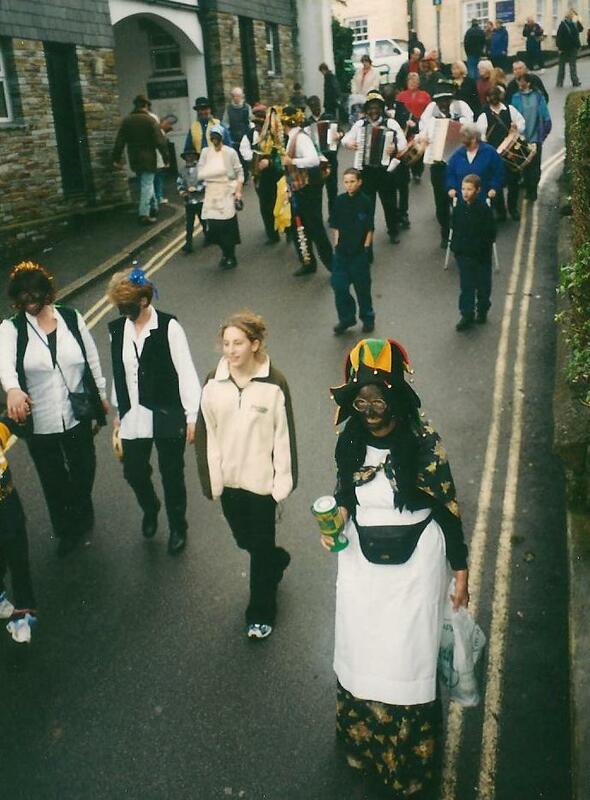 Anyone who’s been to Cornwall will know they can be a bit wary of anyone east of the Tamar, but I don’t think they are racist…indeed they are very friendly, just understandably protection of their traditions. From what I can gather there could be two reasons for the tradition. The simplest is that an adult in the 1920s when the minstrel songs were popular decided to build a repertoire of these songs for the children as they were easier to remember. The other theory is custom was established as albeit a rather ham-fisted attempt to show support for the American black people community or simpler a love of their music. Solidarity for them was often strong in Methodist areas and Cornwall is one of these. An example of this being the strike held in Manchester cotton mills where the pro-slavery confederate army uniforms were being made. Perhaps typically for the British we put our foot in it, and sadly what is seen as once support has naturally become offensive. A parody rather than show parity by dressing up – but again as blacking up is a common motif for begging is that a coincidence? 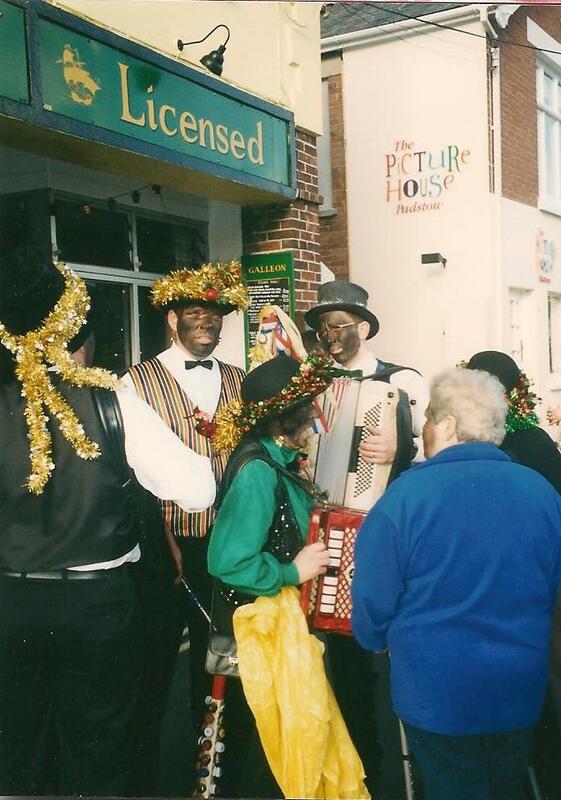 Interestingly now the name is changed, perhaps the one thing which would stop the racist accusations would be to stop blackening their faces, costume aside which is although is claimed minstrel based is common to many folk groups. It was a sensible compromise. Now that this is done, would anyone really be offended after all we’ve all been singing Beyoncé and Michael Jackson songs and not been called racist..have we? 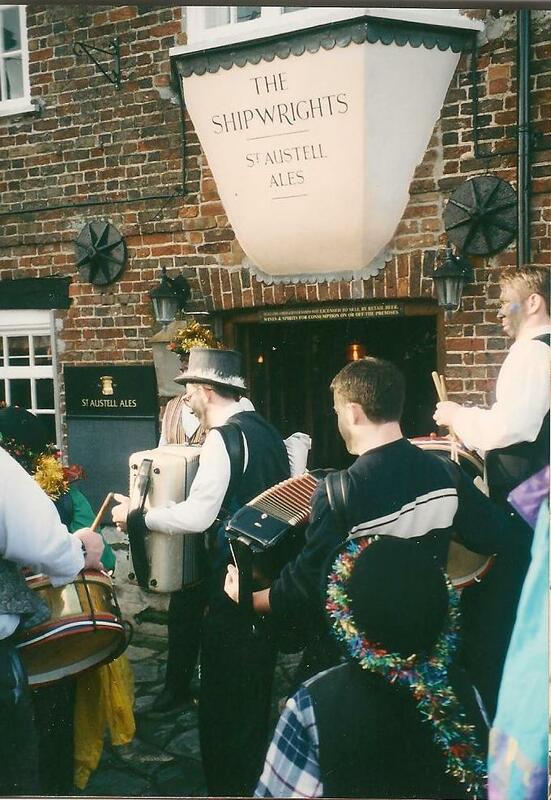 The John Knill Ceremony often called the Knillian is perhaps because of the combination of its bizarre stipulations, quincentarian nature and picturesque nature of the custom and its associated seaside town, is the archetypical calendar custom. Basically a glorified dole with specific conditions. 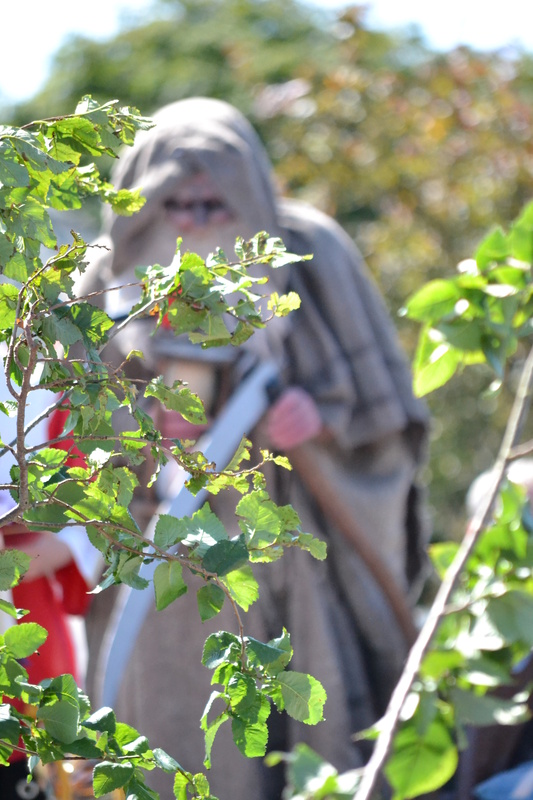 Of course being every five years means that all eyes are focused on the town on the Feast of James, that is 25th July. Being so rarely done it is a time that anyone and everyone interested in customs or indeed connected to the custom will try to make. In many ways, John Knill, the founder, both customs collector (exercise and customs that is) and Mayor of St. Ives in 1767, is a personal role model, a man determined to establish the most bizarre custom so that he could long be remembered. This campaign to be remembered begun in 1782 when he instructed the building of a fifty foot triangular pyramidical folly – subsequently called Knill’s steeple – as jointly a sea mark for shipping, his mausoleum and subsequently the foci of the custom. Ironically due to reasons over consecration he was not interred there but at St. Andrew’s Holborn some 281 miles – a bit too far for a procession and not as picturesque for a custom! So the mausoleum became a real folly! 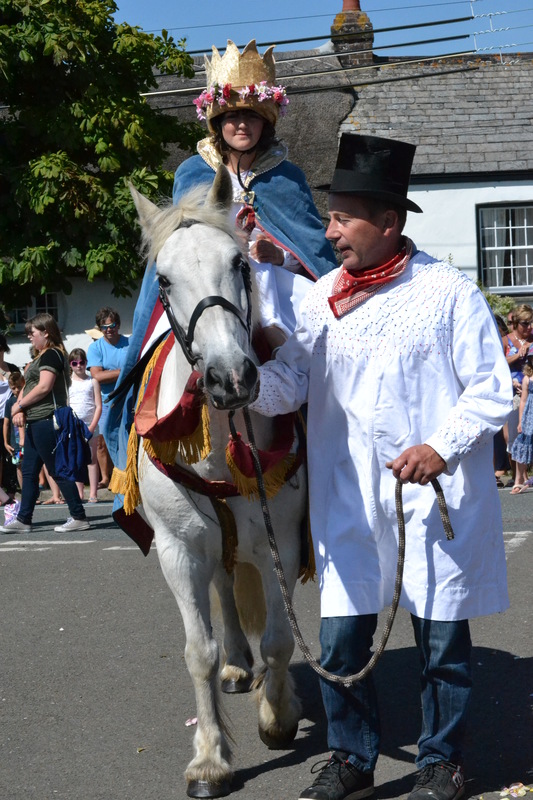 “Early in the morning the roads from Helston, Truro, and Penzance, were lined with horses and vehicles of every description. These were seen midst clouds of dust pouring down the sides of the mountains, while thousands of travellers on foot chose the more pleasant route through the winding passages of the valleys. At noon the assembly was formed. The wrestlers entered the ring; the troop of virgins, dressed all in white, advanced with solemn step, which was regulated by the notes of harmony. The spectators ranged themselves along the hills which enclose the extensive Bay, while the pyramid on the summit seemed pointing to the sun, who appeared in all the majesty of light, rejoicing at the scene. 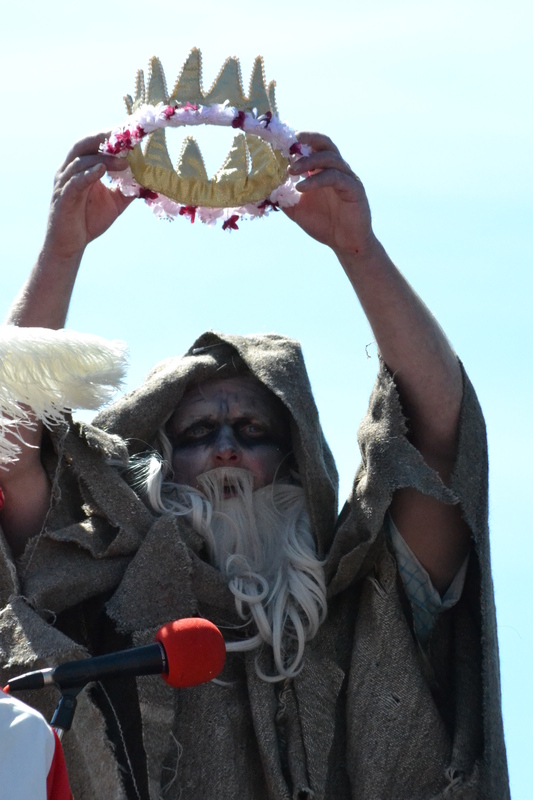 At length the Mayor of St. Ives appeared in his robes of state. The signal was given. The flags were displayed in waving splendour from the towers of the Castle. “£10 for a dinner for the Trustees who are the mayor, Vicar and Customs Officer plus two guests each. This dinner was to take place at the George and Dragon Inn, Market Place. £5 to ten young girls who have to be the daughters of either fishermen, tinners or seamen. of ten years (without parochial assistance). I doubt these are still given out…so too the money for the best followers after the fishing boats…they themselves gone! 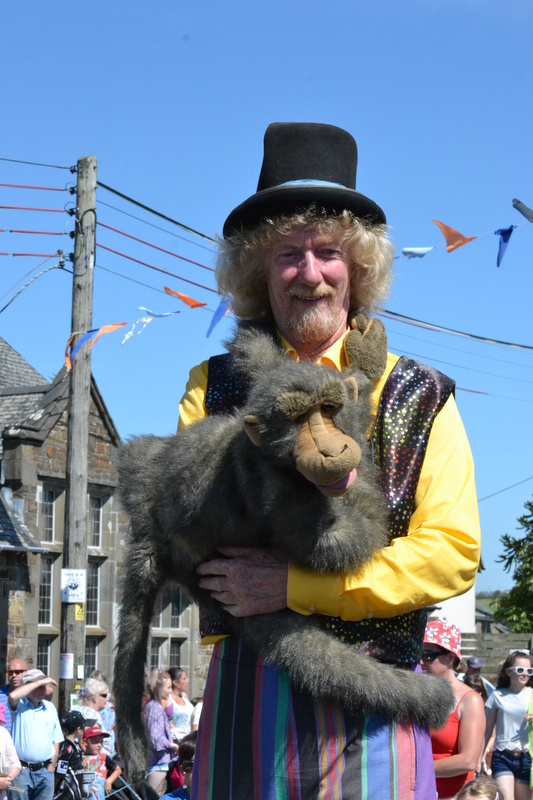 As for the other stipulations these are still done and the monies are handed out in silk purses from his ancient chest on the steps of the town’s Guildhall but now the Fiddler gets £25 – well he does do a fair bit of work and in 2016 he came from Padstow! Interestingly there was some controversy regarding the children chosen..some of which were apparently not descended from these processions and too young, when older ones could have attended!! I like a bit of local intrigue! Leave, O leave, S. Ives below. Where vanity and fashion meet. Around 10 a large crowd had begun to assemble outside the Guidhall, where the stipulations of his Will and the story of the custom was related. The large metal chest inscribed with “Knill’s Chest 1797” was temporarily removed from the museum and put on the table at the foot of the steps. With some humming and ahhing, the table was removed for a better one, more befitting and the chest placed upon this – nobody noticed! Remember they have had five years to organise this! Soon the Mayor, Vicar and Custom officer appeared. These are pivotal characters for each hold a key to the chest and as such all three keys need to be used to open it. Although to save embarrassment it appeared someone had already opened it and discretely propped it open with a piece of old wood. The Master of Ceremonies welcomed everybody, or rather those at the front as the mic did not work – remember five years planning! The Mayor introduced the custom and soon all three keys were in the lock and the chest was ceremonially open to cheers. Then all three hands went to distribute in white purses the monies owed as stipulated. Just as the ceremony was about to proceed to the dancing a furious squall arrived drenching everyone ‘shall we hold off?’ I heard cry ‘no it’ll pass over’…and with such faith in the transient British weather they were off. Indeed the walk to the monument is quite a long one and all along it were people making this five yearly pilgrimage – I jumped into a taxi! By the time I reached the top there was already a throng of people being entertained by a Cornish music and dancing group. Not late for his funeral! Interestingly, unlike many benefactors of curious dole customs John Knill was able to witness the first of his established custom in 1801. It is not recorded whether he attended the 1806 event but he was barred from attending the 1811 event as he died on 29th March 1811! Soon the fiddler could be heard and the party flowed through the crowd and made their way into the mausoleum’s enclosure. The girls assembled along the long wall around the Steeple and the others in the party beneath as the Master of Ceremonies once again explained the story and everyone readied themselves as the Fiddler led the girls, widows, Mayor, Vicar and Custom master around the monument. The girls were understandably more enthusiastic in their dancing around, spinning and skipping, the widows a little less, but the glint in their eyes suggested they dearly wanted to and giggled at the oddness of it. Then the Master of Ceremonies called all those assembled to sing the Old Hundreth – the words helpfully in the commemorative booklet. The sounds of the crowds singing could no doubt be heard for miles around. Then another dance was called for around the monument and after a few thank yous, the Vicar was called to give his blessing to the crowd..at this moment a heavy storm appeared again and fitting the wind and rain and ‘making it as brief as possible’ he blessed us on our onward journey and it was over for another five years! 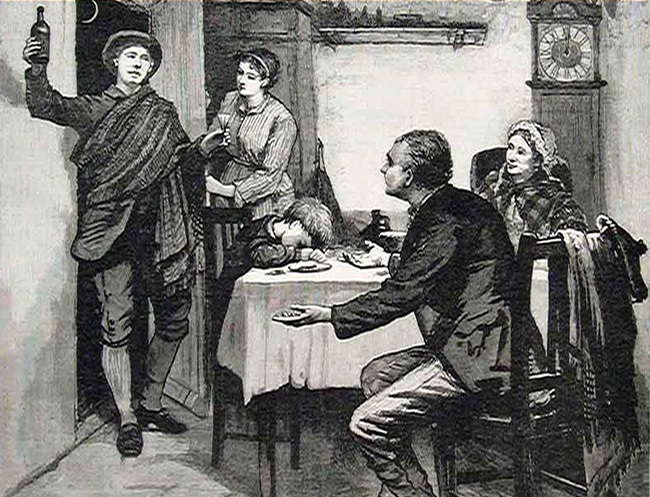 This would suggest that the custom had an element of boundary perambulation possibly mixed with begging, although no money appears to have been extorted, but likely to be related to the luck giving akin to first footing. The folklore journal of 1886 notes that these pots were often filled with broken sherds and rubbish and after it was destroyed a new one would be purchased and thence filled with beer! Robert Hunt (1903) in his Popular Romances of the West of England notes that St Paul’s had an association with tin miners. He notes that he possibly came over with the Phoenicians. Gwennap claims that St Paul preached there and obtained tin from Creekbraws mine, a belief supported by the local Methodists. He is also said to have preached to Dartmoor miners where a cross now sits on the road to Plympton to Princes-Town. Of course was noted for his persecution of Christians and in particular St Steven’s stoning. By stoning pots on the Eve of his Conversion, were they symbolising his bad deed before redemption?